Mark's Tickets is the best place to find tickets for Baltimore Orioles fans. Just check this page for any new events or schedule updates throughout the year. We sell tickets to every Baltimore Orioles game around the world. We know how passionate Baltimore Orioles fans can be about baseball, so we make sure to have hundreds of tickets for every game available right up until it starts. For those looking for cheap Baltimore Orioles tickets, we offer tickets starting at very low prices (many times below face value). 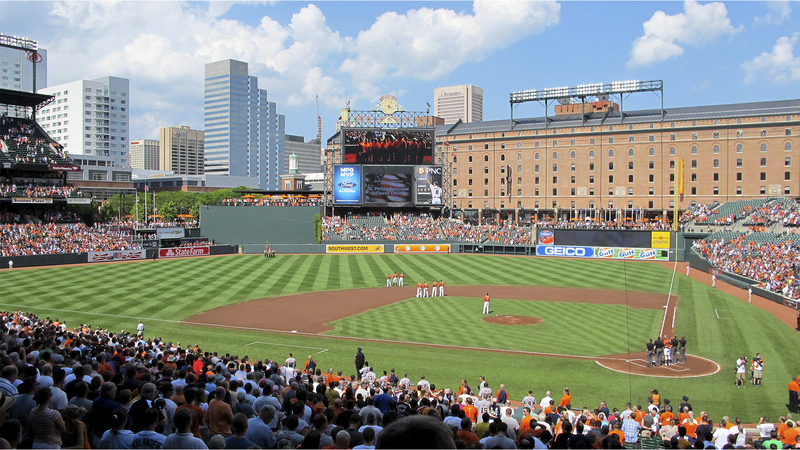 We offer tickets in most sections of every venue that you can see Baltimore Orioles. Simply choose the city or venue that you are interested in below, and you will be able to see all of the available seats. Do not forget that Marks Tickets also specializes in sold out Baltimore Orioles tickets. No longer will sold out shows prevent you from seeing Baltimore Orioles. The Baltimore Orioles are a professional baseball team that plays in the MLB. The Orioles play their home games at Oriole Park at Camden Yards in Baltimore, Maryland. With 162 games per year, and 81 being home games, The Baltimore Orioles are a professional baseball team based in Baltimore, Maryland in the United States. They are a member of the Eastern Division of Major League Baseball's American League. One of the American League's eight charter franchises in 1901, it spent its first year as a major league club in Milwaukee, Wisconsin, as the Milwaukee Brewers before moving to St. Louis to become the St. Louis Browns. After 52 often beleaguered years in St. Louis, the Browns moved to Baltimore in 1954 and adopted the Orioles name in honor of the official state bird of Maryland. The Orioles name had been used by previous major league baseball clubs in Baltimore, including the American League Baltimore Orioles franchise from 1901–1902 that became the New York Yankees and the National League Baltimore Orioles. Nicknames for the team include the O's and the Birds. The Orioles experienced their greatest success from 1964–1983, as well as the mid-1990s, winning eight Division Championships (1969–1971, 1973–1974, 1979, 1983, 1997), six pennants (1966, 1969–1971, 1979, 1983), three World Series Championships (1966, 1970, 1983), two wild card berths (1996 & 2012), and five Most Valuable Player awards (3B Brooks Robinson 1964, OF Frank Robinson 1966, 1B Boog Powell 1970 and SS Cal Ripken, Jr. 1983 & 1991). Despite being one of the most historic major league franchises, the O's suffered a stretch of fourteen straight losing seasons from 1998 to 2011. However, the Orioles posted a winning record in 2012 and qualified for the postseason for the first time since 1997. The Orioles are also well known for their successful stadium, the trend-setting Oriole Park at Camden Yards, which opened in 1992 in downtown Baltimore.